Editor’s note: The following talking points further explain the concept of Global Seafood Assurances, the new, independent, not-for-profit organization that the Global Aquaculture Alliance launched at Seafood Expo Global in April. 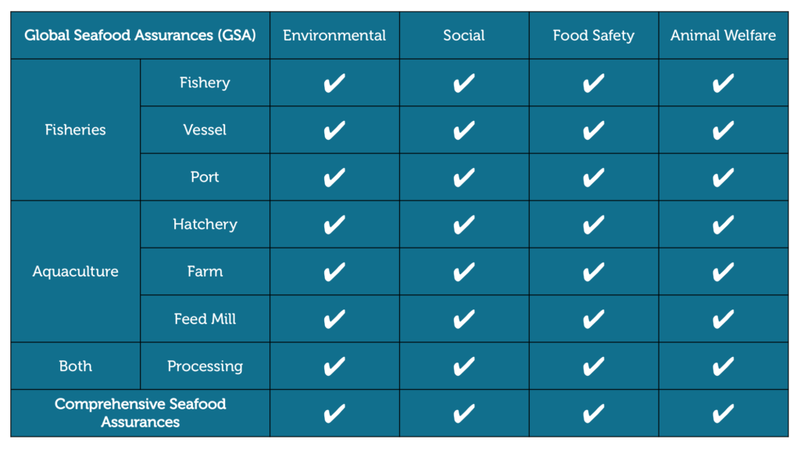 Global Seafood Assurances (GSA) is a new, independent, not-for-profit organization launched to provide comprehensive, credible supply-chain assurances for farm-raised and wild-caught seafood while addressing gaps in aquaculture and fisheries certification. GSA was established to meet marketplace expectations for assurances across the board in aquaculture and fisheries. Those assurances will flow from third-party certification programs that have been benchmarked by a combination of the Global Sustainable Seafood Initiative (GSSI), Global Food Safety Initiative (GFSI) and Global Social Compliance Programme (GSCP) and will address integrated assurances for environmental responsibility, social responsibility, food safety and animal welfare. GSA will be open to any certification program choosing to be a part of full supply-chain assurances for either farmed or wild seafood. Fishery Improvement Projects (FIPs) and Aquaculture Improvement Projects (AIPs) will also be considered for representation. To provide credible assurances for both wild and farmed seafood to the marketplace that seafood is responsibly grown and sustainably harvested. This includes the full supply-chain assurances for sustainability, social responsibility, food safety, and animal health and welfare. Why is GAA embarking on the initiative? GAA has a long-standing commitment to advancing responsible aquaculture practices, defending the aquaculture industry through well-founded science and grow a sustainable global seafood supply. GAA has evolved to proactively address both production and market issues by working with all aquaculture stakeholders on practical solutions. With a strong foundation in aquaculture, GAA strives to bring this strength to wild fisheries. There are some areas in the seafood supply chain that still pose a significant risk to corporate responsibility. Social responsibility aboard fishing vessels is one such area that is currently not well addressed by existing certification programs. Lack of comprehensive coverage and equivalency across all standards also leads to confusion, duplication and added cost. The purpose of GSA is to fill those gaps and provide credible assurances to the marketplace that farmed and wild seafood is responsibly produced throughout the entire production chain. GSA intends to fill the gaps while linking the various silos of certification together. As GSA develops dialogues across the supply chain, more detail and opportunity will emerge to create efficiencies and leverage intellectual good for all. By providing comprehensive assurances to the marketplace, GSA will ultimately enable retailers and foodservice operators to be in a better position to increase per capita consumption of seafood. What will GSA not do? GSA will not be creating new standards where they currently exist or be a benchmarking organization. It’s important to note that the work of GSA is not intended to result in the harmonization of existing certification standards for aquaculture and fisheries but rather to represent critical assurances to the marketplace. Qualifying certification programs will continue to operate separately, though there’s the potential for realizing efficiencies through combining administrative- and service-oriented tasks such as traceability technology, data analysis, certification-body management and accounting. Is there a certification associated with GSA? Yes. At this time, it is the Seafood Processing Standards, currently under public comment. The public comment period ends July 1, 2018. Are there opportunities for partnerships? GSA management seeks to engage with interested parties to help develop the organization into an efficient and useful service provider to the global seafood industry. The GSA is open to partnerships with standard holders, but it should be noted that they will need to be third-party benchmarked by GSSI, GFSI or GSCQ to help ensure only the highest quality standards are being represented. Contact Wally Stevens at wally.stevens@seafoodassurances.org, Bill Herzig at bill.herzig@seafoodassurances.org or Jeff Fort at jeff.fort@seafoodassurances.org.